We would like those blue skies to return quite soon, wouldn't we. Lol. Have I done that the cute way you spell it ? Lol. Could you plant another tree and protect it somehow ? it got canker as well so we didnt think we could plant in the same spot, could we? Oh by the way I like your tree and the lovely blue sky TT. Maybe we'll have more soon. I guess you would have to replace a lot of soil in that area. Did your tree die a few years ago? Were you able to dig up all the roots ? Glad you like my tree and blue sky.... raining now to water the tree.. Lol. we dug it up about 5 years ago but i still find rotting roots in the border, so havnt liked to put anything in. never mind, got a new cat now who uses my dining room table and chairs! That must be the reason TT. It sais you added two today. Never mind. The one you've added is a lovely photo. I had a nice tree in the old garden. It had small pale blossoms on it in early spring and they looked so delicate with a blue background.. I miss that tree but it would have been too big for here. How tall is the one in your photo ? In previous gardens I've owned, I've planted the same type of Prunus. It does grow larger, but I guess you can prune a prunus. Lol. Stunning picture TT - there is something really special about Spring don't you think ? !! If you still find rotting roots, not a good idea to plant another..
You've beaten me to it TT, was going to put one on of our Cherry. Blue skies shining on me :) It looks great TT. How did I miss this yesterday when I really needed blue skies? Lovely blossom, TT. Today started out blue but seems to be clouding over. Pretty & the sky looks nice & blue. I like your Harrogate show photos. Just magical....blue sky and pink blossom. Good shot new camera? Shogetsu is listed as an alternative name. It's a lovely blossom, whatever we call it. LOL. I've been practising with my digital camera recently ! Gradually getting used to it.... Lol. 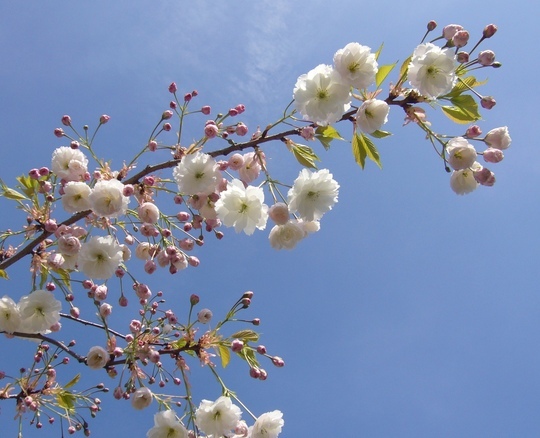 Beautiful photo of the blossom & sky. Beautiful TT, late finding it as I have been laid up for the best part of the past 2 weeks with 'flu! Looking at my homepage, I don't have a chance of catching up with all the goings on! Blue sky in Hawaii, nooooo in good old UK no less, A-1 pic. It really looks beautiful at this stage when half of the flowers are still buds with promise of blooms to come. Yes, I like blossom at the parts-in-buds stage. Great photo TT, makes you feel good, looking forward to lots of sunshine. Your garden will be sprouting lots of new chocolate bars....Lol. Stunning pic. Wish I'd thought of laying under ours to take a piccy when it was full of blossom, my background detracts from the beauty of the blooms. The sky behind really shows them off. beautiful pic not sure what plant it is in my photo but will have a look through my books and find out for you thanks. I'm glad you like this pic. This photo really cheered me up.Earlier today I was in the conservatory watching the wind and rain batter the garden,stopping me from going out to play.My hands were jammed in my pockets,my shoulders were hunched up, my mouth was down at the corners and my eyebrows were down almost covering my eyes. Then I went on GOY, saw this pic and everything looked brighter and full of promise. Thanks TT. I hope your eyebrows are back in place now. Lol. gorgeous pic......great tree, such a soft colour, what's it's autumn colour like ? I think the leaves go deep gold in Autumn.. Thanks. I guess you get lots more blue skies than we do in Britain... Lol. A photo to come back to in November when Spring's a long way off! Ahrr yes I had seen it, its lovely isnt it I can see why its your favourite. lovely blossoms. I can believe that as some of my photos don't show how some pictures really look, do you live north or south of uk? Sort of in the middle...Lol. Like me then as it does effect how soon things blossom in the months, I live in Warwichshire county not town. What a lovely picture. beautiful tree! !